Do you have a facility that provides shelter for racehorses or houses livestock? Do you want a better way to keep your veterinary hospital or zoo facility clean and safe? One of the best ways to provide antimicrobial protection is by installing the latest in antimicrobial floor surface systems. This blog post introduces floor surfaces with antimicrobial technology by Polylast Systems, LLC. Mathusek installs antimicrobial and environmentally-friendly floor surfaces by Polylast Systems LLC that’s made to meet demands for clean, comfortable and safe solutions that have equine, cattle, canine and veterinary medicine in mind. Although antimicrobial flooring protection is also ideal for hospitals, fairgrounds, gyms and parks, this blog post focuses on animal-inclusive facilities. Polylast surfaces use Microban® antimicrobial technology to ensure microbe-inhibiting product protection. Learn more about what protects Polylast surfaces at microban.com. Keep this in mind as you consider Polylast Systems, LLC for your flooring. Polylast’s antimicrobial floor surfaces are made of 100% recycled rubber, which makes them one of the strongest, most durable and most environmentally-friendly flooring options on the market. It is an attractive floor with custom options and a range of colors, including lighter floor colors that aim to improve depth perception and help horses feel comfortable. Plus it is easier to clean and disinfect than any other system, making it an ideal choice in places where cleanliness is critical. Why use Polylast for your animal facility? It doesn’t just provide a cleaner surface, it also provides the most slip resistant floor. 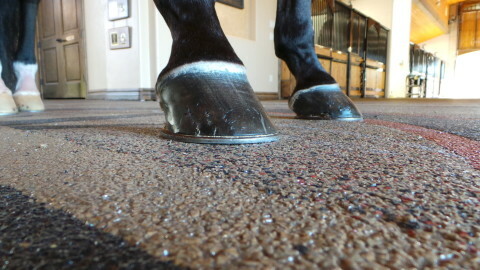 The rubber surface helps animals maintain footing and minimize strain. It absorbs up to 60% of shock to reduce lameness and injury. It ensures cleanliness in the air and underfoot. Plus it remains cool in the summer and warm in the winter. Since this floor surface with antimicrobial protection eliminates the need for mats to pull, clean and replace, you save time and money on cleaning. Get the superior antimicrobial floor surface that’s backed by a ten-year warranty from Polylast Systems, LLC and Mathusek, a Polylast-certified installer. Discover our floor surfaces with antimicrobial options. Contact us about your unique flooring needs. For more information about the ILS Financing Program, contact Kim White by email, or phone 800-438-1470, ext. 109. Visit Mathusek’s Financing Page to learn more about this offer.